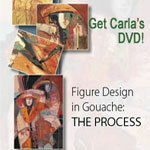 Carla’s DVD workshop stresses the importance of the steps you take to create a painting, not the final product. To Carla, the process is the most important aspect of her art. Her approach is one of incredible discipline and expressive free thought. She follows the “what ifs” but focuses on a different design principle at every stage of her work. In the tradition of the old masters, she brings up the entire painting at every stage. She starts big and broad then slowly adds detail. Each stage of her thinking focuses on a different design principle. She starts with a quick gesture drawing of her model. This loose, abstracted sketch, which Carla calls the “set up,” serves as the framework for her painting. Carla works flat, integrating her main shapes into the background before transferring her image to watercolor paper. 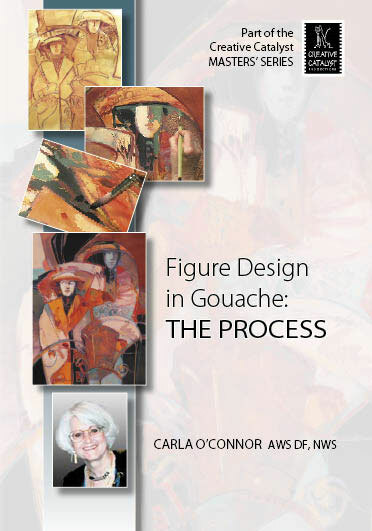 As she works with gouache, Carla shows you how to break down the steps of your painting process and concentrate on one aspect of design at a time. She demonstrates building rich color and texture through many layers of paint. Carla delves into more than just the technical aspects of laying paint onto paper. She discusses the importance of emotion in your work and when to tackle difficult subject matter. She offers ideas on making your paintings more personal and encourages you to take risks as an artist.